The objective of this lab was to determine the oxidation state of copper through a procedure using precise stoichiometry and observing the reaction between copper and silver nitrate and their products of copper nitrate and silver. There are multiple safety hazards that are associated with working with silver nitrate. One of the main hazards is that if silver nitrate comes into contact with skin, it will cause burns and will “stain” the skin for the next couple of days. This can be easily avoided by wearing gloves and other protective clothing. Another hazard is inhalation. If silver nitrate is inhaled, it may cause shortness of breath, nausea, or even unconsciousness. This can also be easily avoided by working in the fume hood so as not to inhale any silver nitrate. In this reaction, copper is being oxidized, originating with no charge and losing two electrons in the reaction to form a +2 charge. Silver is being reduced as it starts with a +1 charge and gains an electron to form no charge. In this reaction, copper is being oxidized, originating with no charge and losing two electrons in the reaction to form a +1 charge. Silver is being reduced as it starts with a +1 charge and gains an electron to form no charge. By spilling the NaCl into the beaker, the student is adding another reactant and therefore causing another reaction (NaCl(aq) + AgNO3(aq) --> AgCl(s) + NaNO3 (aq)). Because copper gains a +2 charge and needs all of the silver nitrate to fully react, the sodium chloride reacting with the silver nitrate will take away some of the silver nitrate reactant meant for the reaction with copper. This means that less silver and less copper nitrate will be created as, instead of having a perfect molar ratio, the silver nitrate becomes the limiting reactant and less silver is produced. 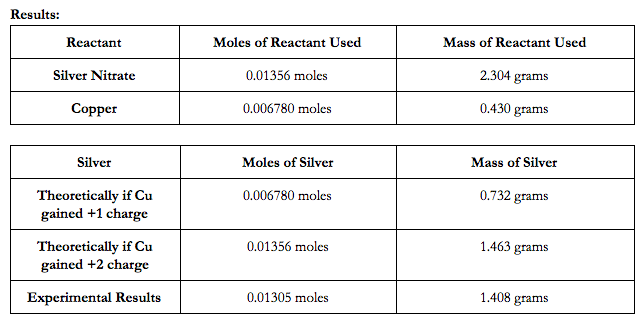 Due to the decrease in silver production, the student may mistake the copper to have gained a +1 charge as only 1 mole would be produced per 1 mole of silver nitrate, instead of the correct 2 moles of silver per 2 moles of silver nitrate. While one may also think that the NaCl would react with the Cu(NO3)2 produced by the other reaction, it does not due to the fact that both products of this reaction would be aqueous. In addition, one may think that that the copper originally put into the beaker would react with the NaCl, however this does not happen as sodium is above copper on the reactivity table. If a similar experiment were to be conducted, Iron would be best replacement reactant for copper . This is because iron can form either a +2 or +3 charge when ionically bonded. Aluminum would not be ideal as it always gains a +3 charge when ionically bonded and gold would simply not react with the silver nitrate as it is less reactive than silver and would be unable to replace it. Thus, iron would be the only logical option as a replacement for copper. The nitric acid acts as a catalyst in the reaction between copper and silver nitrate. A catalyst works by lowering the activation energy of a reaction so that less energy is needed to start it. 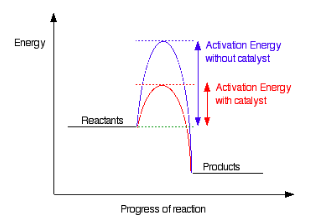 The graphs below show an exothermic example where the catalyst clearly lowers the activation energy. In the specific case of nitric acid and the copper and silver nitrate reaction, the nitric acid weakens the attraction between silver and nitrate in the silver nitrate compound, causing it to be easier for the copper to replace the silver. Overall, our lab was successful in determining the oxidation state of copper through a reaction using stoichiometry. In our lab, we had silver nitrate in excess, such that if copper gained a +2 charge (Cu(s) + 2AgNO3(aq) --> Cu(NO3)2(aq) + 2Ag(s)), two moles of silver would be produced for every one mole of copper put in, but if the copper gained a +1 charge (Cu(s) + AgNO3(aq) --> CuNO3(aq) + Ag(s)), one mole of silver would be produced for every one mole of copper put in. From this, we figured out that, using our mass of copper available, if the copper gained a +2 charge, the reaction would produce 1.463 grams of silver, whereas if the copper gained a +1 charge, the reaction would produce 0.732 grams of silver. We determined through experimentation that the copper gains a +2 charge as in our reaction, we produced 1.408 grams of silver, a number far closer to the 1.463 grams and 2:1 silver to copper ratio expected for Cu +2 than to the 0.732 grams and 1:1 silver to copper ratio expected for the Cu +1. Based on this data, we determined that we had a 96.24% yield of silver for the predictions based on the Cu +2 ion. While the margin of error in our experiment was relatively small, there were still minor errors that account for that 3.76% of silver that went unyielded. One error was the fact that we may not have gotten all of the silver off of the filter paper that we placed in the drying over. While we got most of the silver off, there was still a miniscule amount left on the filter paper and if we had massed the dry filter paper before adding the silver and subtracted that from the mass of the filter paper with the dried silver on it, we would have gotten a more accurate value for the silver produced and it also would have given us a higher percent yield. Another error in our experiment was the fact that we may not have given the reaction enough time to fully react. We noticed that as we were removing the solution from the hot plate, we could not tell if there was any more copper left. If, in fact, the reaction was continuing as we removed the beaker from the hot plate, the copper would not have fully reacted and the amount of silver possible would have been decreased also affecting our percent yield in a negative way. The easy solution to this would be to allow the reaction to simmer on the hot plate for a little longer in order to make sure that the reaction was fully complete. By being more patient, we could make sure that all the copper reactant reacts. In addition, we noticed that, because the solution was on a hot plate, the nitric acid added as a catalyst may have boiled off due to its low boiling point of 83º C. While we tried to combat this by adding more nitric acid every so often, there is no true way to know when more should be added. This may have slowed down the reaction as there may have been points where there was no catalyst (other than heat) acting upon the reaction, causing it to slow down. In the future, we can make sure that this doesn’t happen by making sure that the solution stays below 83º C so the nitric acid does not boil off and can continue to act as a catalyst throughout. Though these errors did not affect our experiment in a large way, they are still significant and can help us for the next experiment we conduct. In addition to fixing the errors in our experiment, there are also other ways to improve and expand on the procedure. One idea would be to test different catalysts other than nitric acid and their effect on the reaction and the yield of silver at the end. We could also take the current procedure a step even further by finding out the percent purity of our ending silver sample. While our yield may have been high, it is highly possible that the purity wasn’t as high and that there wasn’t as much silver as we had originally thought in our final sample. One way to test the purity would be to use a common acid test found online that changes color based on the purity of silver. While there were errors and are possible improvements, this lab was incredibly successful. Through our calculations, we determined that 1.224 grams of copper (II) nitrate was left over in our reaction using the 96.24% yield that we had. We also determined that 0.0866 grams of silver nitrate would be left over, also using the 96.24% yield and assuming that the unyielded product was due to unreacted reactants. However, if the unyielded product was due to silver left on the filter paper, we would have close to 0 grams of silver nitrate left due to our exact 2:1 molar ratio of silver nitrate to copper. We also determined that the 1.408 grams of silver we produced would be worth 76.3 cents in today’s silver market.